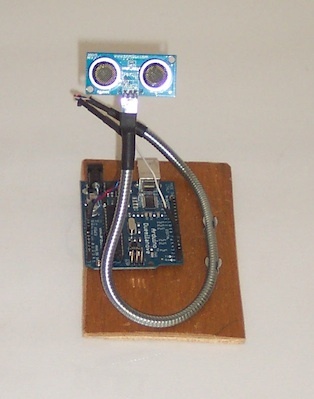 The Gagglina prototype has been imagined, designed and developed in order to experiment personally with such interfaces, and primarily with the link between sensor (in this case 'pings'), physical computing board (in this case Arduino) and SuperCollider audio language. Currently, Gagglina is used in conjunction with the software patch 'Melodia', investigating the control of creative melodic generation through physical movement. (to allow room for a battery box). Triggered / 3: Melodia @ New Materialism Conference, June 2010, Cambridge UK from Richard Hoadley on Vimeo. Gagglina/Melodia Hardware/Software Interface from Richard Hoadley on Vimeo.